Turunc Istanbul Day Trip is the easist way to explore Istanbul during your holiday. Our primary tour price includes transfer to the airport, flight tickets in both directions, all entrance fees, English-speaking guide, full insurance and the transfer from the airport to the hotel. 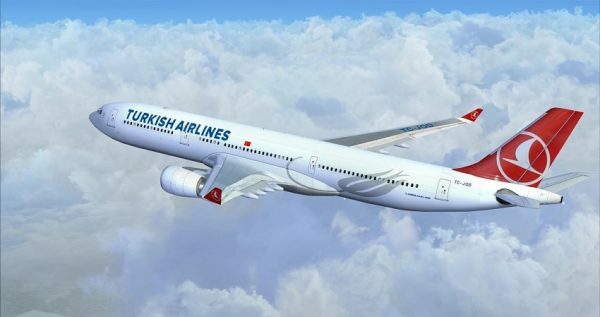 On this particular tour we will be flying to Istanbul from Dalaman airport, Turkey’s biggest city. This proud and gorgeous city that is situated on two continents, Asia and Europe, is a perfect place to learn something about Turkey, its people and its past. 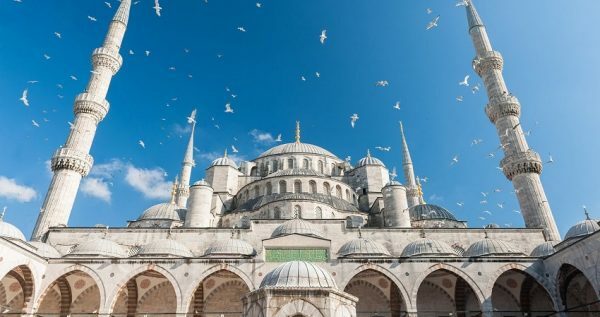 Historical landmarks, architectural wonders, and 14 million people is what makes Istanbul one of the most popular tourist destinations in the world. This city has such a vast and rich history that it had two names before the current one. It was first called Byzantium, and then Constantinople. Its position always made the city desirable for foreign invaders, but also carefully guarded by its inhabitants. Istanbul combines best features of East and West. 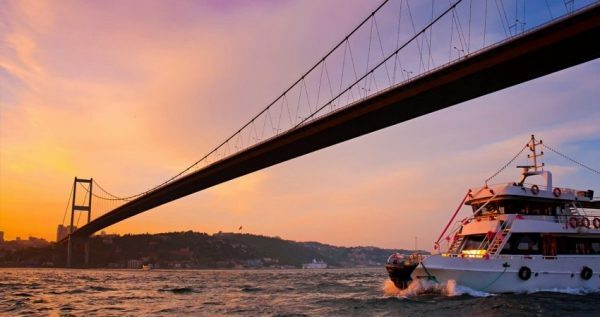 During the day this captivating city is a dream for every tourist, and once the night falls Istanbul is heaven for all the clubbers and night-life fans. Our first destination in Turunc Istanbul Day Trip is the famous Blue Mosque, or the Sultan Ahmet Camii. The mosque was built more than 400 years ago and it still welcomes worshippers from all over the world. That also means that the mosque isn’t always open for touristic visits, because there are the prayer hours. The mosque got its name because its interior walls are embellished with hand-painted blue tiles. The Blue Mosque has five principal domes, six minarets, as well as eight secondary domes. 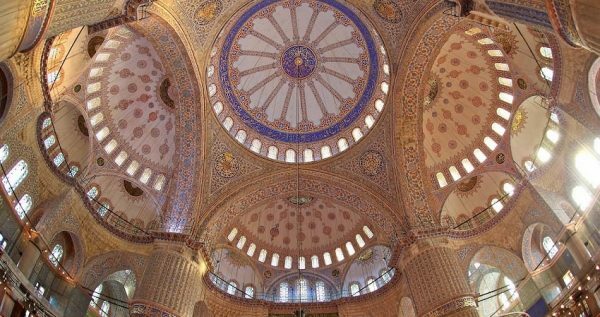 The architecture combines Byzantine Christian features and elements of the traditional style of the Islamic architecture. The magnificent Blue mosque is considered to be the last majestic mosque of the Ottoman architecture’s classical period. The interior is astoundingly beautiful with more than 20000 beautifully designed Iznik ceramic tiles, but the most important part of the interior is the mihrab. Mihrab of the Blue Mosque is made of marble, and it includes a niche made of stalactite, as well as the panel above it with a double inscription. Considering its beauty, it is no wonder that this mosque is one of the most popular tourist destinations. Next in Turunc Istanbul Day Trip, we will visit the marvelous Topkapi Palace also known as the Seraglio. This palace is now a prominent museum, but in the 15th century it was the administrative headquarters and the residence of the Ottoman sultan. The building of the palace was instructed by Mehmed the Conqueror who conquered Constantinople. Common people named the palace “Topkapi” which is Turkish for “Cannon gate”. This grand palace was very important up until the 17th century. By that time new palaces were built and new sultans preferred them over Topkapi. When the Ottoman Empire ended in 1923 Topkapi became a museum, and it is today managed by the Ministry of Culture and Tourism. 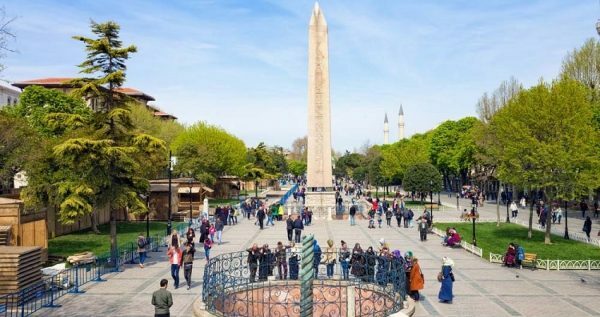 Today tourists visiting the palace can access the treasury, the Ottoman imperial harem, and they can also see the famous Spoonmaker’s Diamond and Topkapi Dagger. as well as much more. 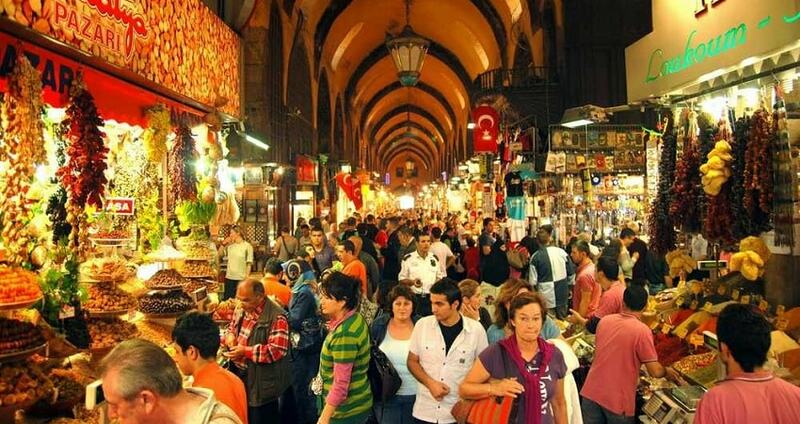 One of our destinations in Turunc Istanbul Day Trip is also the amazing Egyptian Bazaar, or the Spice market. This famous and busy bazaar was created as an important part of the New Mosque establishment. More precisely, this bazaar was made to finance the needs of the New Mosque. The construction was ordered by Sultana Turhan Hatice, who was a mother of sultan Mehmed IV. The bazaar got the name “Egyptian Bazaar”, due to the fact that it was made with the tax-revenues levied on goods imported from Egypt, which was an Ottoman state at the time. This colorful bazaar has been the mere center of the spice trade in the city since its inception. However, some new shops are starting to flourish replacing some old spice shops, so that just adds to the versatility of the market. Bazaar hosts 85 shops selling a huge variety of items including spices, soaps, sweets, souvenirs, dried fruits, teas, herbal medicines, nuts and so much more. Once Turunc Istanbul Day Trip ends, we will head to the airport. After we land, our driver will come and take you back to your resort place in Turunc. The flight lasts for around 45 minutes and tickets in both directions are included in the primary tour-price. 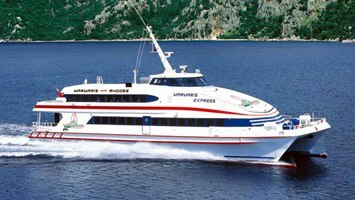 The tour price also includes transport from your accommodation to the airport, full insurance, entrance fees, services of an English-speaking guide, as well as the transport from the airport back to Turunc. If you like historical sites then a visit to Ephesus can be also interesting for you. Our driver will come at the scheduled time to pick you up in front of your respective place of stay in Turunc. After a cozy drive we will get to the airport and you will board the plane to Istanbul. Airplane tickets, hotel transfers, full insurance package, as well as the services of an expert, English-speaking guide are included in the tour price of Turunc Istanbul Day Trip. Istanbul is a gorgeous cosmopolitan city, situated on two continents, Europe and Asia. 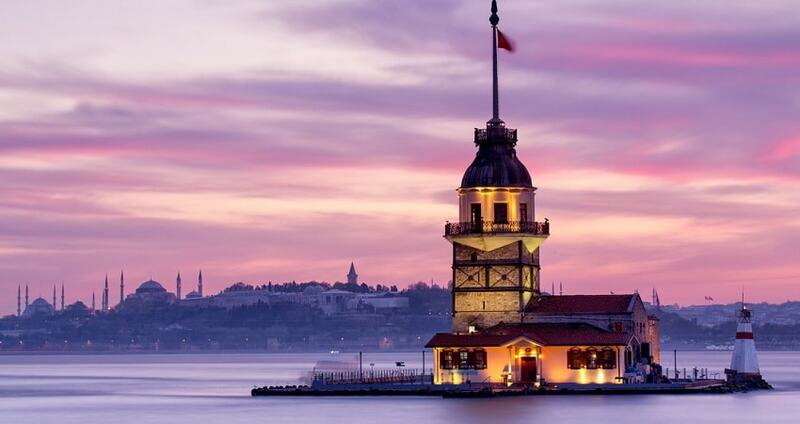 This vibrant city is the perfect place to learn new things about Turkey, its eventful past and its hospitable people. Architectural achievements, historical sites and 14 million inhabitants is why Istanbul is among the most popular destinations in the world. This city has an interesting history and it had two names prior to the current one. Byzantium was the first name of the city, and then it was renamed to Constantinople. Its position always made Istanbul attractive to foreigners, but also seriously guarded by its own people. Istanbul brings together the best characteristics of East and West, and it truly has something for everyone. The first destination on Turunc Istanbul Day Trip is the prominent Blue Mosque, also known as the Sultan Ahmet Camii. The mosque was constructed over 400 years ago and it is active as a temple of religious worship to this day. That means that the Blue Mosque isn’t open for touristic visits at all times, as there are the prayer hours during which the Muslims come to the mosque to pray. The mosque got its memorable name because of one major detail in its interior – more than 20.000 gorgeous blue tiles. The Mosque has five predominant domes, eight secondary domes and six minarets. The architecture style includes Byzantine Christian aspects and essential elements of the traditional Islamic architectural style. 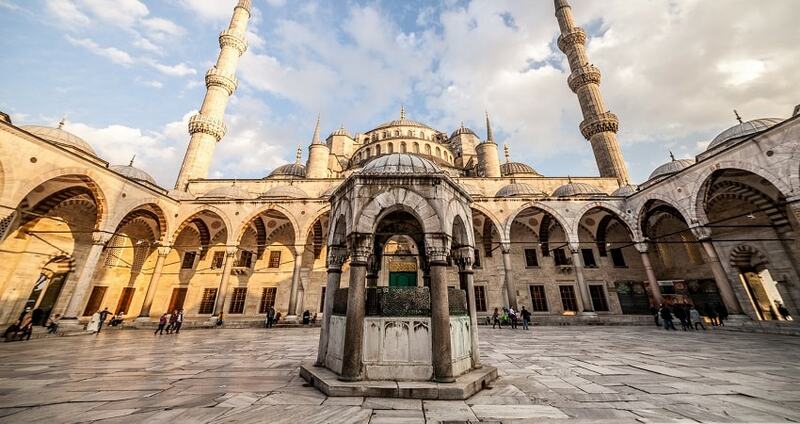 The glorious Blue mosque is often referred to as the last majestic mosque of the classical period of Ottoman Empire. The most significant part of the interior of the Blue Mosque is the mihrab. This particular mihrab is made of marble, with a stalactite-niche, and the amazing panel above it. Considering its both exterior and interior beauty, it is no surprise that this magnificent mosque is one of the most frequently visited tourist destinations. The stunning Topkapi Palace, or the Seraglio, is now a reputable museum, but during the 15th century it was the center of political life of the Ottoman Empire. 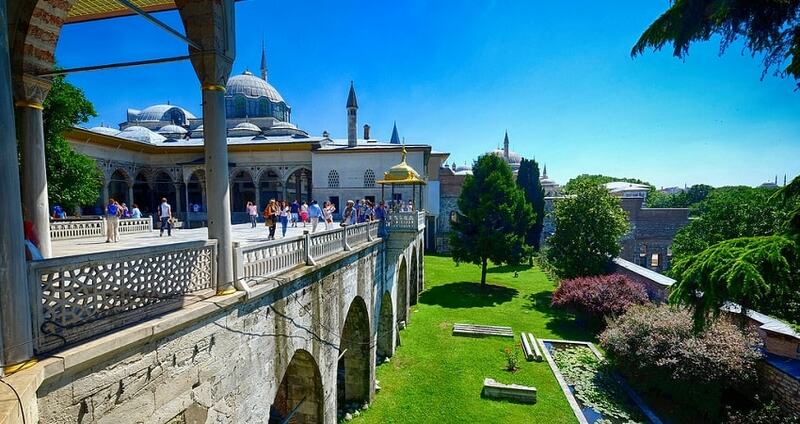 Topkapi was the administrative headquarters, as well as the political residence of the Ottoman sultans at that time. The building was ordered by Mehmed the Conqueror who named it The New Palace. 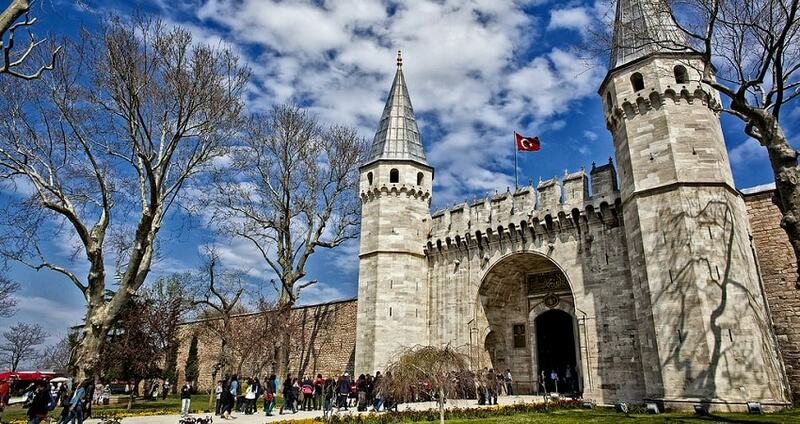 However, commoners named it “Topkapi” which is a Turkish word for “Cannon gate”. This brilliant palace was very politicly important until the 17th century. In the meantime, some new palaces were made and new sultans liked them more than Topkapi. When the end of the Ottoman Empire came in 1923 Topkapi Palace became a prominent museum. Today the museum is managed by the Ministry of Culture and Tourism. Tourists visiting the Topkapi Palace can see the Ottoman imperial harem, the treasury and they also get to see the marvelous Spoonmaker’s Diamond, famous Topkapi Dagger, and much more. Hippodrome of Constantinople, located in Sultanahmet/Istanbul, was a public arena mainly for chariot races in the ancient world. Today there many interesting still standing such as Obelisk of Theodosius Kaiser Wilhelm’s Fountain. Spiral Column Rough-Stone Obelisk. One of our most beloved destinations in Turunc Istanbul Day Trip is definitely the awesome Egyptian Bazaar, also called the Spice Market. This busy bazaar was constructed as a significant part of the establishment of the New Mosque. This specific bazaar was built to finance the work of the New Mosque. The construction of this great bazaar was instructed by Sultana Turhan Hatice, mother of Sultan Mehmed IV. The market got the name “Egyptian Bazaar”, because it was built with the funds gathered of the tax-revenues levied on items imported from Egypt. This bazaar has been the center of the city’s spice trade since its making. Currently, some fresh new shops are starting to work replacing some spice shops, which just adds to the overall versatility of the bazaar’s offer. Spice Bazaar has 85 shops which are selling a wide variety of items such as spices, sweets, soaps, souvenirs, teas, dried fruits, nuts, herbal medicines, and so much more. Once Turunc Istanbul Day Trip ends, we will go to the airport. After landing, our driver will take you back to your respective place of stay in Turunc. The flight lasts some 45 minutes.k to your accommodation spot in Icmeler.